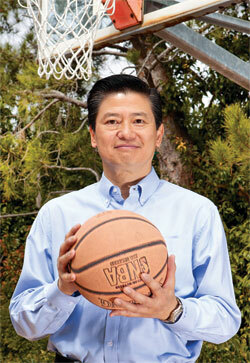 The basketball hoop affixed to the Irvine, Calif. garage of Victor Tsao (M.S. CS ’80) and his wife, Janie, was just one of many in an area dominated by Los Angeles Lakers fans. But this one was emblematic of the slam-dunk its owners scored in 1988 when, using the garage as a makeshift workshop, they created the multimillion-dollar wireless computer network company Linksys. While the couple later sold both their Irvine property and their company, a Spalding in-ground basketball pole is in place in the backyard of their home today, in Newport Coast, Calif., not far from the residence of Kobe Bryant, the Lakers’ all-time leading scorer. Tsao says that basketball has been his passion since he was a kid, when he played on his junior high team in Taipei, Taiwan. He has not only derived physical benefits from the sport but also has gleaned some practical applications as well, centered on the concept of the team. The Tsaos have comprised their own team of two since first meeting as students at Taiwan’s Tamkang University, and married after they came to the United States. In 1977, the couple moved to Chicago, where they attended graduate school, then settled in California. Over the next decade, they gained both academic knowledge and corporate experience, holding a variety of positions in companies such as TRW, Inc., where Janie served as a systems manager, and Taco Bell Corp., where Tsao was director of MIS strategic systems development. All the while, they discussed their vision for a line of computer peripherals based around the concept of connectivity, and began development during their free time. “After two years, we had our product line ready and had enough customers to pay our bills,” says Tsao, noting that it was a family affair, with sons Michael, now 27, and Steven, now 25, helping to package the products. In less than 15 years, Linksys became the global market leader in wireless and broadband hardware for small-to-medium businesses and home environments. The company secured shelf space at major retailers and earned numerous industry awards. In 2001, it was named to the Inc. 500 Hall of Fame, recognized, in part, as one of 22 companies on the list with sales exceeding $100 million. The Tsaos wanted Linksys to expand in the global marketplace and, in 2003, sold the company to Cisco in a stock arrangement valued at $500 million. They were hired by Cisco as part of the executive team heading the new Linksys division and remained with the company until 2007 before shifting their focus to Miven, which was founded in 2005. “My role at this point in my life is to share my experiences, even though I’m still always learning new things myself, and to be of value to others,” says Tsao. A multistage venture and public equity investment firm, Miven Venture Partners provides capital for consumer-related technology startups in the areas of information technology, telecommunications, converged media, entertainment, and wireless. Having previously acquired a vast network of contacts throughout Asia, Tsao focuses his efforts on China, but has also assisted promising talent in California and Israel. Some of their investments have included the wireless provider Celeno and Vivotech, a leading provider of high-performance Wi-Fi chips for high-definition multimedia and Near Field Communication equipment and applications. Tsao knows that mistakes are also possible without greater cultural awareness. Through the Tsao Family Foundation, the Tsaos and their son Michael are working with the nonprofit Center for Asian American Media (CAAM) to produce a series of documentaries promoting understanding and communication. The series, shot in China by filmmaker Patrick Shen, will provide examples of typical Chinese behavior while offering insight into religious beliefs, historical references, and customs. Young notes that his crew is aiming to complete production of the first film in the series, tentatively titled The Art of Work, by the end of 2012, in time to premiere at a major international documentary film festival. Although living in America for the past 34 years has blurred his own Chinese-American boundaries, Tsao believes his dual identity brings a unique advantage to the filming process. He remembers an instance when he exhibited decidedly non-American business protocol. When the Cisco-Linksys integration team asked Tsao for his vendor agreements, he momentarily choked. “I don’t have even one!” he says he told the group, adding that for many years, he sealed every business transaction with not much more than a handshake. “Within one month I obtained agreements from all 12 vendors across Taiwan and China, and since that time, have made sure that I have documents on every matter,” he says, laughing, wanting to be a good team player, American-style.